Fireworks #55 continues to bring you the finest from the world of rock, all wrapped up in glorious glossy Technicolor. 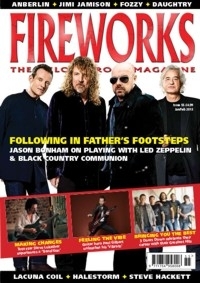 This time, we have a terrific article with Jason Bonham, explaining what it's like playing for supergroup Black Country Communion and steeping into his father's shoes performing with Led Zeppelin, which was captured on the spectacular 'Celebration Day' release. We have guitar heroes galore with the likes of Mr Big's Paul Gilbert and Toto's axeman Steve Lukather talking about their solo releases. 3 Doors Down tell us about their greatest hits, while Chris Jericho is keen to tell us about Fozzy's new album and UK shows. On top of that, the legendary voice of Survivor, Jimi Jamison, talks about his superb new record while the likes of Halestorm, Anberlin and Daughtry add their considerable firepower to a stellar line up. It's amazing we had room for Dare, an album preview with melodic rock stars W.E.T. and a chat with Lacuna Coil. There's loads of other stuff too, with over 100 new albums reviewed, plus our live review of the sell out Firefest 2012 along with the latest reissues and DVDs. We've even given you two FREE bonus interviews below with Fools For Rowan and Mia Klose. Happy Christmas!